For the next few Thursdays in August, I will be sharing some great recipes utilizing a variety of leafy greens. Although typically referred to as winter greens, they grow amply in the summer and are as great on warm days as chilly ones. They are also packed with nutrients! The first leafy green I will be featuring is kale. Kale is super versatile. It can be used in salad, made into chips (omgsogood), put into smoothies, and sauteed in a variety of ways. Next to spinach, I think kale is probably the most popular and most used leafy green of the moment. Very trendy. It is chock full of vitamins C and K, calcium, and beta carotene. It plays well with others, and although it is slightly bitter (it is a green after all), that flavor really softens up in the right setting. There are several varieties of kale, but the most common are typically curly kale and lacinato kale, also known as Tuscan kale or dinosaur kale. 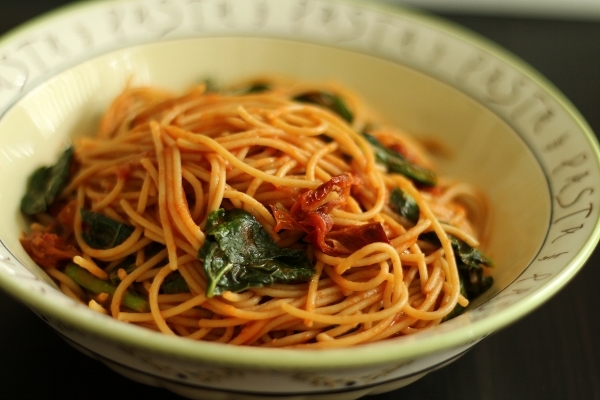 I made a simple and healthy pasta dish utilizing some whole-grain spaghetti, a bunch of Tuscan kale, some sun-dried tomatoes, garlic, chili flakes, and tomato sauce. 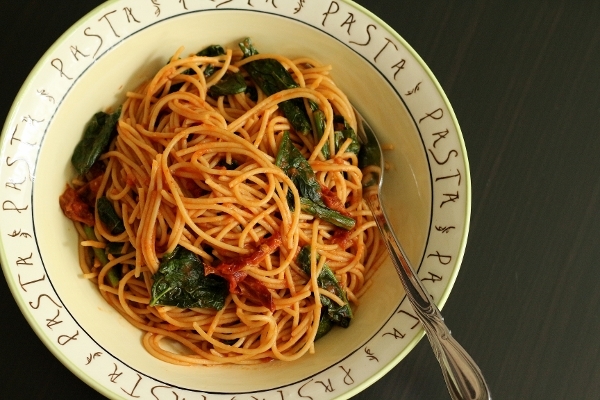 The sun-dried tomatoes and tomato sauce offer a slightly sweet and acidic counterpart to the more aggressive kale. When the sauce comes together (in a matter of minutes) the bright green contrasting the red from the tomatoes reminds me a bit of Christmas. 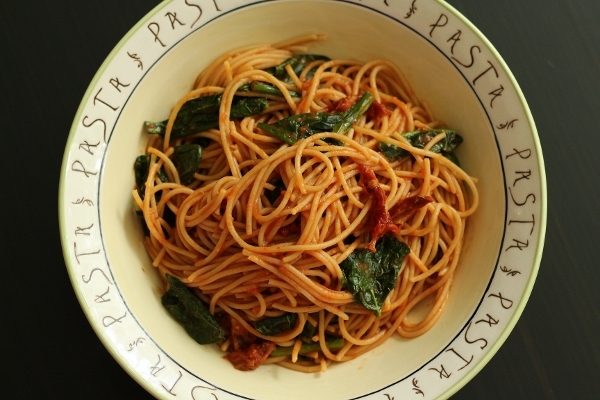 This is a considerably healthy pasta dish (if you exercise portion control, just like any pasta), and it's high in fiber and vitamins. 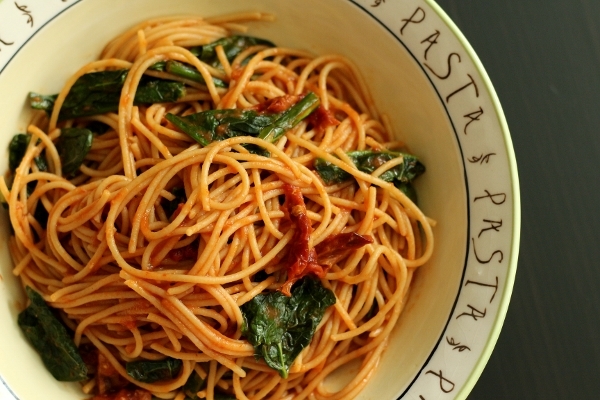 Sun-dried tomatoes can be overplayed at times, but I really love them and think their sweetness is a great addition to nearly any pasta dish. 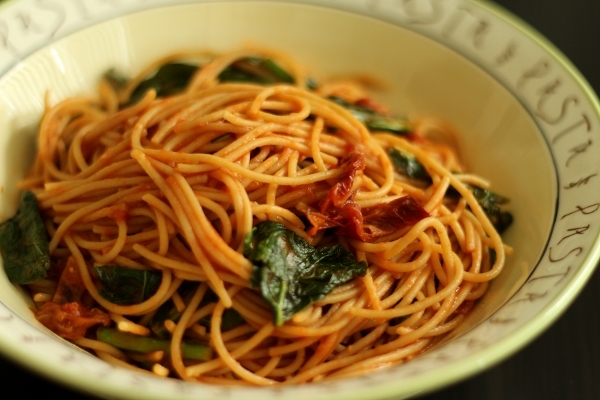 Add the spaghetti to a pot of boiling salted water and cook until al dente. Drain, reserving some pasta-cooking water for later. In a large saucepan over medium heat, add the sun-dried tomatoes in their oil and saute for a few minutes until they soften and sizzle. Add the garlic and chili flakes and cook for another minute. Deglaze the pan with the tomato sauce, scraping the bottom to make sure any dried up bits loosen up into the sauce. Add the kale, season with salt and stir. Cover the pan and allow the kale to wilt down for a few minutes. After it has wilted and become slightly tender (it should still have a bit of a bite to the stalk), add the cooked spaghetti and toss to coat over low heat. Add pasta water, a little at a time, until it loosens up the sauce and begins to nicely coat the pasta. Serve hot.